Vivek Tiwari gave me a copy of his book SDN and OpenFlow for Beginners with hands on labs in Kindle format to review. As SDN is a subject I’m interested in and have done some writing on myself, I agreed to review the book. something that you can read in three or four sittings. A book that gives you an idea about SDN, helps you speak intelligently about it, enables you to ask intelligent questions, and even gives you the sense if this is something that you would want to pursue further. On that promise, the book delivers completely. The book isn’t very long, is easy to read in plain-spoken English, and uses a number of analogies, comparing SDN to common objects in the real world. Part I: What is SDN? Chapter 2: What is SDN? Chapter 14: What does SDN mean for Companies like Cisco and Juniper? Chapter 21: Ring !! Ring !!……. Ping!! As you can see from the layout, Vivek takes the reader down a logical progression regarding SDN and OpenFlow, laying a foundation, then building on top of it. Especially insightful and useful for me personally was Chapter 4 on how OpenFlow relates to certain memory operations in network switches. TCAM is one of those things that’s been on my list to research for a while, and Vivek reminds me to poke into this interesting topic even more deeply. The perspective of the book aligns reasonably well with my impressions of the state of SDN right now, although the market is changing week by week. If you’re skeptical about Vivek’s emphasis on OpenFlow, I think it’s entirely appropriate considering the purpose of this book. OpenFlow is one of the few things in the SDN world that crosses vendors. OpenFlow is also one of the most accessible tools to demonstrate how SDN is different from traditional networking. Which, in fact, is exactly what Vivek does in Part II of the book. Using VMs, Vivek demonstrates how to use an SDN controller to program a virtual switch called mininet through OpenFlow. Following Vivek’s instructions & screenshots, anyone with a technical clue will be able to set up an OpenFlow lab on their workstation. That said, it’s worth pointing out that many vendor products de-emphasize OpenFlow, instead focusing on overlays like VXLAN to deliver network virtualization. Topically, Vivek doesn’t go in the overlay direction – which is fine. All the vendor approaches vary, so it would be a struggle to cover in such a laser-focused book. 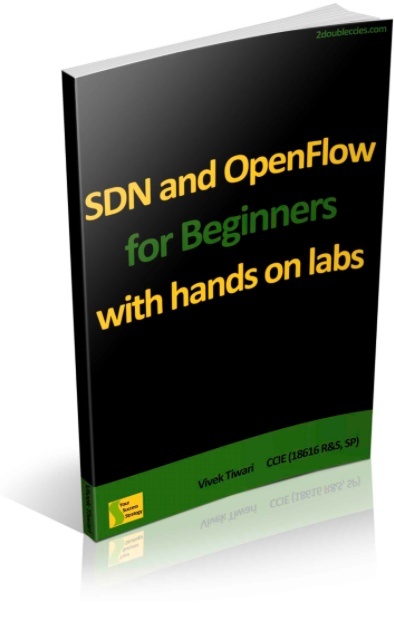 SDN and OpenFlow for Beginners with hands on labs is available from Amazon for $7.99. That’s a fair price, in my opinion. If you are considering buying it in Kindle format, you might want to opt for a different format. While not a huge problem, this book suffered from the same challenges I’ve run into with almost every technical book I’ve gotten on Kindle: diagrams and screenshots are a bit of a pain to look at, and text formatting of fixed-width device output can suffer. Update: I checked with Vivek, and there is no print version of this title available at this time. Your choices are Kindle or ePub via the iTunes store. That said, don’t let my complaints about formatting throw you. It’s not a big deal, just one of those things you deal with when reading technical e-books supported with illustrations or code output. Hi Ethan and thanks. Are you aware of it being released in paperback? I can’t currently see it as an option. I’ve read Vivek’s guide on doing the CCIE lab and I like his style of writing, although the formatting on that book was a little annoying (being mostly double line spaced). I checked with Vivek, and there’s no paper version. Kindle or iTunes. Same question as Matt, do you know if I can get a non-kindle version? this is a short book, summaries of what can be found easily on the internet already. However, the summaries are good and it can get you started if you’re not familiar with SDN. If you’ve been reading about SDN already for awhile you might want to look elsewhere. It is a short book, but FWIW, there’s more value there than you give it credit for due to the labs. Lots of time-saving there if you don’t have an SDN lab setup already.